Alpha Cook: Plant. Grow. Eat. Believe it or not, the weather is about to improve. If you're one of those people with a foot of snow still sitting on your deck, it's doubtful that you've been planning your summer garden. But if you want to be the first kid on the block with squash and tomatoes, now is the time to start those seeds indoors, especially if you live in a region that doesn't need to thaw out. 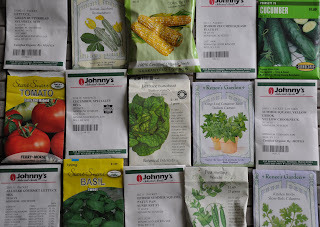 If you haven't played in the dirt all that much before, and don't know where to start, I've listed a few veggies below, and the best way to get your seedlings started. You can plant in a variety of containers. 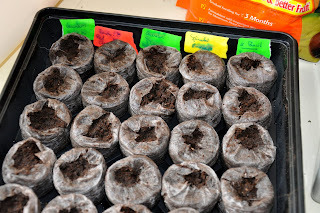 I usually start a bunch of seeds with peat pods (Jiffy brand is the kind that pops up in most big stores) that you can pick up at any hardware store like Home Depot or Orchard Supply, and if you save the containers you can refill the pellets later. I also save leftover six pack containers and smaller plastic planters to start seeds in and to transplant more delicate seedlings, like tomatoes, until they're sturdy enough to be planted. When using containers instead of pellets, make sure you use a potting mix (also sometimes called “soil-less” mix), and not garden dirt. Potting soil is typically much lighter, and (mostly) free of unsavory garden insects and disease goop, so your baby plants will sprout up healthy. Making sure the soil/pellet is moist, you'll want to plant about 2-3 seends per planter/pellet. After you plant your seeds, place them near a light source in the house. Keep the soil moist, but not sopping wet. For the peat pellets you only need to water when they start to dry out and turn light brown. For the potting mix, a very light watering every couple of days should do the trick. You may want to use a spray bottle in the early stages to soak the dirt. After a while (depending on what you planted, but probably about a week) you'll see very small delicate seedlings emerge. You will probably be more excited than one might consider appropriate for the situation, especically if you have a sordid history of killing defenseless houseplants. If you planted them in one of the those little plastic Jiffy greenhouses, take the lid off. In another week or so, you'll start to see more prominent growth, notably the development of “true leaves,” the leaves you might see on an adult plant. You're going to want to start thinning them now; choose the strongest, healthiest seedling and say to it “all your weakling friend must die!” Then remove said company. Thinning creates a strong plant and reduces the chance of the remaining seedling's growth being stunted. If you really have trouble letting go of the weak little wee ones, you can attempt to transplant those other little seedling to another space. (However, they often don't survive the move.) Get your seeds planted now so you'll be caught up! Now! Right now! I've actually just bought a Topsy Turvy Upside-Down tomato planter and will go get some seeds this weekend. I can't wait till spring! Sounds like fun--let me know how it works out. Getting ready to plant the tomatoes next week!